Happy New Year, Big Blue Nation! Here’s hoping you chugged a bottle of bad champagne, you didn’t make out with that weirdo co-worker that smells like cheese at the office party, took full advantage of Uber, and ultimately survived what I like to call “Amateur Night”. Those hipsters out bar hopping all over Lexington should be banned from any and all NYE festivities. In fact, I want to exile the lot of them to a deserted island for bringing skinny jeans back. Seriously. We’ll call it Skinny Jeans Island. Punishment, served. To this fan, 2015 was a roller coaster of huge emotional swings. There was good. There was really good. There was almost historic excellence. There was anger. There was confusion. There was screaming. There was soul searching. There was drinking. There were tears. There were “WHY AM I STILL DOING THIS, GOD?” questions screamed to the high heavens. Then, there was more drinking. Suffice to say, Big Blue Nation’s emotions ran the spectrum. Let’s take a look back at 2015 and see what we have to look forward to in 2016, shall we? Kentucky basketball almost went undefeated and got all historic and stuff. They were this close, folks. This close to making history. I am still not emotionally prepared to talk about the Wisconsin game. It’s just too hard. To my dying day, I will always contend that losing Alex Poythress to a torn ACL was what ultimately caught up with the Wildcats. Without Poythress and his defensive abilities to guard multiple positions, as great as Kentucky was, nobody could have matched up with Sam Dekker. That guy killed us. I hate him. We have Tyler Ullis to look forward to. I’ve been screaming since early 2015 about the sophomore point guard from Chi-Town being the best point guard in the country in 2016. So far, my prognostication abilities are proving true. Ullis controls Kentucky’s tone on both sides of the floor better than other Coach Cal luminaries (namely John Wall, Brandon Knight, and Andrew Harrison). Not often do we get to see a pure point guard the likes of Tyler Ullis wearing a Kentucky jersey. Enjoy it. Matthew Mitchell is still the man for those that doubted him. 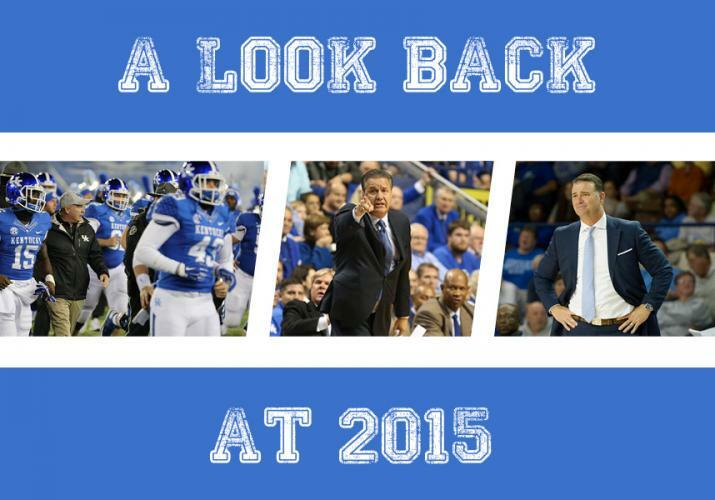 Who cares about the rash of transfers Kentucky Hoops has seen? As of this writing, they are undefeated and #8 in the country. What’s interesting is that Mitchell isn’t deploying the full court chaos Big Blue Nation is accustomed to. Turnovers are down, shooting percentages and assists are up, and Maykala Epps is playing All-American ball. Mitchell has been so close to getting Kentucky to their first Final Four in school history. Is 2016 the year the ticket is finally punched? I hope former offensive coordinator Shannon Dawson didn’t buy a house in Lexington. The former West Virginia play caller never seemed to fit in with what Mark Stoops envisioned his offense looking like, “ineptitude” is the nicest way I can describe how Kentucky’s offense looked most of the season. I would use more “colorful” language, but my granny reads this. Over and over, it looked like there was no game plan, no adjustments, and the play calling was more predictable than a Louisville scandal (three in 2015, for those keeping score at home). Best of luck. Sorry, you won’t be missed. Please, Coach Stoops, hire a special teams coordinator. As I’ve been writing this, two punts and three kickoffs have been returned for touchdowns against the hapless Wildcats. The season ended two months ago. It was that bad. Kentucky will have the #1 recruiting class in the country. Again. Bam Adebayo. Malik Monk. De’Aaron Fox. Wenyen Gabriel. Sacha Killeya-Jones. That’s three, maybe four NBA lottery picks. Dominance like this never gets old. I will stare at my football season tickets renewal form for five hours deciding if I should renew them. Forty years of life, forty years of Kentucky football heartbreak (excluding most of the Rich Brooks regime). Coach Stoops is pleading for patience from a very unruly, disappointed fan base after last season’s second half dumpster fire. I believe nobody wants to take Kentucky to the next level more than him. I really do. However, after three years, this program is his. Every recruit, every hire, every piece of the football program is his. He has everything he asked for in facilities and an upgraded stadium. Time to start winning, Coach Stoops. Now. Please?